Companies now need to start putting new policy commitments into practice. It is high time for companies to walk the talk. 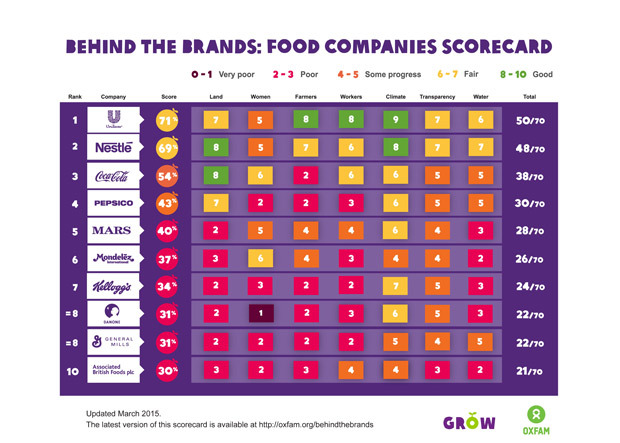 Food producer Unilever overtakes Nestlé by taking over the top spot on Oxfam’s Behind the Brands Scorecard. Unilever tops Nestlé with an overall score of 71 percent compared to Nestlé’s 69 percent. Oxfam’s scorecard ranks the 10 biggest food and beverage companies, “Big 10” on their policies and commitments to improve food security and sustainability. The scorecard covers seven themes impacting the lives of people living in poverty around the world: transparency, farmers, women, agricultural workers, access to land, water and climate change. Eight of the “Big 10” international food and beverage companies have improved their overall scores since February 2014 but French dairy producer Danone and the US based Coca-Cola Company have failed to improve in the overall scorecard. Oxfam publishes its second annual Behind the Brands scorecard update today. The “Big 10” are clearly getting more serious about social and environmental issues, although the level of ambition still varies enormously across the companies with big gaps between the leaders and laggards. In the last 2 years the companies improved their policies on paper but the new Oxfam Behind the Brand briefing Walking the Talk says they still have a long way to go in terms of implementing these new policies in practice. UK based ABF takes last place again on the scorecard list only reaching 30 percent in total. The other three companies at the bottom of the scorecard – Kellogg, Danone and General Mills – don’t even reach half of Unilever’s score of 71 percent. Dairy giant Danone still held a joint Sixth place in 2014 but now falls to a shared eighth place with General Mills. Danone also holds the dubious record of scoring the lowest on any theme in the scorecard – they get only 1 out of 10 for supporting the rights of women farmers and agricultural workers, even the other laggards ABF and General Mills score better on this topic. "After two years of sustained pressure from the hundreds of thousands of Oxfam supporters, The “Big 10” are definitely moving in the right direction. However, the real challenge has just begun. Companies now need to start putting new policy commitments into practice. Only then will real change happen for the millions of small farmers and agricultural workers. It is high time for companies to walk the talk," says Monique van Zijl, international campaign manager for Oxfam’s Behind the Brands campaign. Oxfam launched its international “Behind the Brands” campaign in February, 2013. It ranks the biggest international food and beverage companies, the “Big 10”, on the strength of their policies on transparency, women, agricultural workers, farmers, land, water and climate change. The “Big 10” are Associated British Foods (ABF), Coca-Cola, Danone, General Mills, Kellogg, Mars, Mondelez, Nestlé, PepsiCo and Unilever. ‘Behind the Brands now enters its third year and what it shows is that no company is too big to ignore the demands of their consumers. The same goes for their suppliers, agricultural producers and traders that are also starting to change in line with the demands of the ‘Big 10”, says van Zijl. Download the full report Walking the Talk.